On top of the subduction zone only a couple of km from Bagagna (10,106 inhabitants). Due to the dept and the moderate Magnitude this earthquake van be labeled as harmless. Right on the fault line hundreds of kilometers from nearest Greenland. Very deep in the mantle of the earth. With this Magnitude nobody will have felt it. 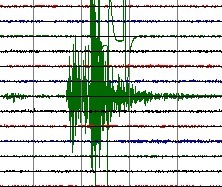 4 minutes after the prior one, but more dangerous because of the Magnitude / Depth factor. Houses are especially vulnerable in this part of the world because of almost no earthquake proof building. Moderate earthquake at a different depth 30 minutes after the other one and almost at the same spot. Moderate deep earthquake at a short distance of Long island which carries a volcano lake with a beautiful name "Wisdom Lake". Harmless because of Magnitude and depth. In the middle of the Atlantic Ocean. Hypocenter deep in the mantle of the earth. Epicenter in between Brazil and Cape Verde Islands. Hypocenter deep in the mantle of the earth. A a lot of people will not have felt this earthquake. The epicenter is located very close to the epicenter of the M 6.9 earthquake. QuakeSOS is a FREE iPhone application developed by Armand Vervaeck, the creator and main contributor to Earthquake Report. The Application simplifies immediate group communication to friends and family members (with your exact GPS location) and is constantly feeding the users with œEarthquake Report news. Together with your own family and friends, QuakeSOS will be your closest earthquake friend.